Data is loaded by one of two methods: drag/drop of a specific chart file, or via a chart library. Any shp or tif file can be dragged into Debrief - provided the prj sidecar files are present. When saving the plot Debrief will record the path to the datafile in the .dpf file in order that it can be reloaded at the next session. Separately, Debrief can provide a folio of charts, though the data must be stored in a specific layout (see Section 15.3, “Storing Chart Folios”), and Debrief must be configured appropriately. Configure Debrief this by selecting the Chart Backdrops page under the Maritime Analysis section of the Window/Preferences dialog. In this page specify the parent folder sitting above any chart folio folders. Debrief will search the subfolders of this location to locate any chart folio files. As you saw, there is also a transparency attribute for charts. Use this to vary the transparency of the charts layers. 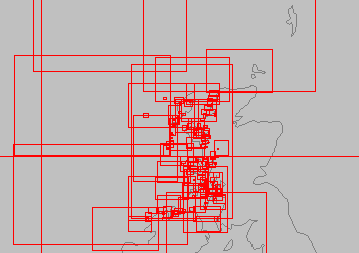 For most analysis the presence of a chart backdrop can make vessel tracks difficult to distinguish. Making them semi-transparent fades them away a little - letting you focus on the tracks whilst still being aware of the backdrop chart data. Unfortunately, the transparency setting isn't observed when you copy the plot to the clipboard. Once pasted in MS Word, all charts are painted solid. Once a parent folder is specified, when you click on Insert Chart Library from the Chart Features menu Debrief will scan the child folders for correctly named shapefiles and offer you a list of folios to choose from. Select one to load the folio. If you right-click on the chart library in the Outline View you'll see the editable properties. These include the colour used for the rectangles plus whether the chart name is displayed against the chart rectangle. The folio displays a rectangle for each available chart. The folio is a top-level layer in the Outline View that you can expand to view (and load) the child charts. 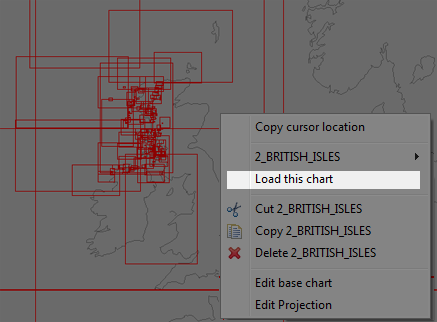 Alternatively, right-click on a corner of one of the rectangles and select 'Load this chart' to load a specific chart. The chart will then be loaded as a separate Debrief layer - and appear in the layer manager. As with any other layer, you can control it's visibility using the Outline View. Note, Debrief isn't going to store the chart image in the plot-file, it's just going to store the path to the Image - which will re-loaded next time you open the plot.